Torino Power Solutions (TPS.C) private placement of units priced at 7.5 cents with 15 cent 24-month warrants. Closing price on Friday was 15 cents. I participated in the private placement for TPS last week. Management has a goal to close it on May 24th, and by the looks of the market price, there is good reason to suspect it will be filled or oversubscribed. However, it doesn't hurt to try to get in at the last moment. I wanted to tell people about this sooner, but I've been busy and there are risks associated with this investment that I wanted to explain. So this write up will take me a while. At least people will have a couple of days to make a decision as well as can use this as a primer on the company should they wish to buy shares on the open market. Why did I participate in this placement? It should be obvious by the stock price. This is pretty much free money if you can wait out the four month hold period and the stock price doesn't hemorrhage 50% back under 7.5 cents during that time. If I was not able to get into the private placement I probably wouldn't buy shares on the open market at this time, but I would keep a close eye on it on my watch list. In the event of big news, I'd rather be one of the first ones in at 9:30, at say, 20 cents, than alerted by price-volume leaders at 9:45 and have to pay 30 cents or more. I believe that TPS has potential for that kind of move. TPS has a clean balance sheet (meaning no debt other than a small amount of payables), around 33 million shares outstanding and around 40 million fully diluted. 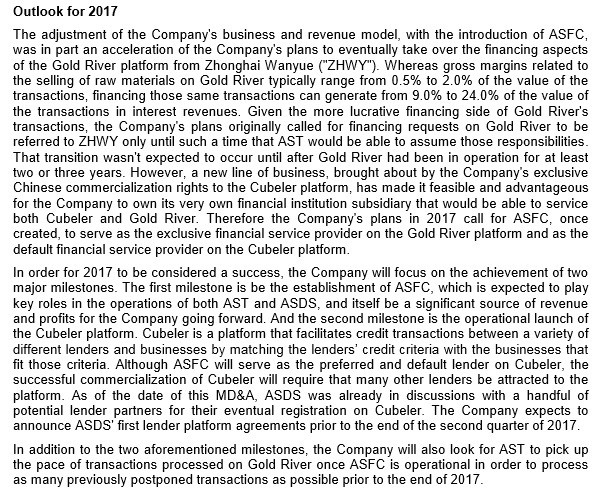 After this financing closes it'll have around 40 million shares outstanding and 50-55 million fully diluted. The float on it is ridiculously thin. Look at this L2. As of this writing there is less than 100,000 shares on the ask to 19 cents. If there is good news on this stock, I can see it racing to at least 30 cents and possibly as high as a dollar in short order, depending on the news. If there is no news and the stock price stagnates, all I have to do is hope it stays in this range or at least above 10 cents in four months when the hold period expires. Having such a thin float does present a risk too, should everyone in the private placement decide to sell shares as soon as the hold period is up and it does tank below 7.5 cents on that selling pressure. If you fail to get into the private placement and wish to trade the stock, be my guest. Unless there is news between now and when the hold period expires I do not foresee myself trading or talking about this stock in depth. So come back in September because I think that's when things will start to get interesting. I'm not going to handhold people through the process so if there's a statement that I made that you're having a hard time finding the source, look through this required reading. technology and proprietary system architecture for application in overhead transmission lines to address the growing demand by electric utilities to adequately increase the capacity of congested transmission lines of electric utilities in North America and Europe. The Corporation does not currently generate revenue. The technology is supported by five existing patents and two pending patents." transmission lines. At time intervals predetermined by the requirements of the utility operator, the technology monitors the temperature and stress of the transmission line conductor as well as the meteorological conditions. The system consists of two major subsystems; a passive part which is a microwave resonant cavity sensor and an interrogator which is an active component. The sensor is installed on the conductor; the interrogator is installed on the pole in a safe zone area." Torino is not the first company to come up with such an idea. There are four other competitors named in the listing statement that sell these types of sensors.This market is not saturated so I have two schools of thought on this. Either there is just not a great enough demand by utilities for this kind of product, or what's available on the market is not meeting the needs of power companies. Anyone from Ontario like me knows the absolute debacle surrounding Ontario Hydro, with the government of Ontario (rightly) taking a lot of heat. Capacity issues will only increase with time as the population grows, particularly in regions under stress already like the Greater Toronto Area. So I am willing to give this sensor industry a shot. Torino believes that it offers a superior product. I believe that the key two advantages over its competitors based on my conversation with the CEO are 1) the system doesn't need a battery nor a power source and 2) the system can measure sag AND conductor temperature of a single line while competing technologies measure either sag OR conductor temperature of a single line. TPS has gotten FCC approval in the U.S. and Industry Canada approval in Canada to operate its Power Line Monitoring system within the specified frequency band last fall. This was obviously a major required step needed by the company in order to proceed with a marketable product. The company's technology was developed at the University of Manitoba and the company owns all patents and design outright. There are two milestone payments of $250,000 each upon achievement of $10 million and $20 million in revenue. So far TPS has announced a trial relationship with one power company, Tri-State Generation and Transmission Association, Inc. The agreement was signed in June 2016. In March the company announced that this trial agreement was upgraded to a more active power line. My first reaction when speaking to the CEO was that this is a VERY long lead time between a trial agreement and a potential revenue-generating agreement. However, I also noted that TPS is only asking for $500,000 in this private placement. Based on the burn rate, I estimate that this money would only take Torino to the end of 2017 if no sales are made. It would make sense to raise a lot more unless there was the expectation that revenue will be coming in 2017. After speaking with the CEO and considering the small raise, I think there is a reasonable chance to expect some kind of revenue-generating agreement in 2017. Though the exact nature of that is unknown to me, for obvious reasons he had to be vague. There is also no guarantee that there will be an agreement announced in the coming months and that the company will need to raise more money in the near future. Each system which contains one Interrogator and three sensors would cover a 12 kilometer radius. As in other words, a typical-sized power company which wanted full coverage would need to order thousands of devices. Even one which wanted to cover only the areas under high stress would need dozens or hundreds. So there is reasonable potential for a news release on a massive sale. The CEO called Torino an IIoT (Industrial Internet Of Things) company. It sounds like they are looking to capitalize on the growing IoT craze which would be a smart strategy to ensure a robust stock price along with executing on the business. The person who I spoke with was CEO Rav Mlait. His business associate, Bryan Loree is the CFO and these two have collaborated on numerous projects in the past. When I spoke with Mr. Mlait, he was courteous and appeared knowledgeable of the opportunity. However, the management team of TPS doesn't appear to be on the level of the management teams of my other major investments. People like the Itwaru brothers or PKK's management are business builders. If you look at their CV, they have a history related to payment processing, fintech and business development in China, respectively. Their prime focus over years has been on their duties to the companies in which I'm invested. Contrast that to Rav Mlait. Have a look at his LinkedIn profile. He and Bryan Loree have had multiple projects, some of them ongoing simultaneously. Mr. Mlait is the CEO of Cannabix Technologies (BLO.C), a marijuana breathalyzer development company and was the CEO of Rockland Minerals Corp, an exploration stage mining company. He jumps from industry to industry. Rather than being a business builder like the people I just mentioned, he appears to be an early-stage promoter. If he wishes to become a business builder with TPS and BLO, he will have to prove that to the market. In the listing statement it states that he expects to dedicate 35% of of his time to TPS, though that may be higher now since he has given up his position with Rockland. But that is still much less than the proportion of time dedicated by Andre Itwaru to FGD or Johnson Joseph to PKK, for instance. Regarding his past mixed history of success, I am going to give him a pass. The very nature of start up investing is high-risk. Many companies fail for every successful one. If you were an investor in Mr. Mlait's companies in the past, you might have lost money on several of them, but then made 500% or more on BLO. A consistent early-stage investor in all of his projects would have made money under his watch. The first major test for Mr. Mlait with TPS would be upon a major contract being signed. I asked him about manufacturing and right now it is all in-house which he described having capacity to build "a few" units. What would happen if a major deal gets signed and a power company orders 1,000 units? Would the company outsource? Or try to build capacity in-house? The latter option is filled with operating challenges and risks. The former option might result in lower long-term margins and the company would be reliant on its supplier to make good on orders. The CEO's answer wasn't very clear to me. That could be indicative that he has a plan in place but can't disclose that to me or anyone else, or that there isn't one in place yet. Torino's lack of size might present a challenge to its sales strategy since its competitors are more mature and may have the capacity to fulfill larger orders. Power companies would know this. So even if the technology is superior, the manufacturing capacity puts Torino at a disadvantage. There are ways around this which an early-stage promoter would understand and may actually be better suited for this company - discussed in the next section. Based on my conversation with the CEO and the small size of the raise, I think TPS has a reasonable chance to procure a contract in the coming months. Once a contract is announced, it might be a good time to offload some shares on the spike. There could be another substantial private placement to raise funds to build the capacity to fulfill the order. Or there may be other challenges that arise as the management team tries to build a business. However, as demonstrated early-stage promoters, Torino's management team may have other ideas in mind. Rather than build the devices themselves, maybe they plan to license the technology. Or perhaps they are fishing for a buyout that will come at a much higher valuation upon further proof of concept with Tri-State or upon a large contract being signed. Early-stage promoters look for an early entry and an early exit to gain a quick profit. No matter what the eventual outcome, I think TPS can return me several times my money in a timeline measured in months if a contract comes. Hell, it's already given me a double (excluding the value of the warrants) and I just wired the money a couple of days ago. First Global Data (FGD.V) (FGBDF) announced that it completed the first phase of beta testing with LianLian Pay to provide remittance functionality on WeChat. The company made the bold statement that it "believes that this is the world's first social messaging multi integrated remittance platform whereby SOCIAL converges on FINTECH in the flow of cross border money." So when people bring up what looks like competition or that the company is over-embellishing their accomplishments, make sure to dig deeper. I am very pleased with Andre's response. Many companies I have dealt with have been evasive when interrogated like this. Andre gave a very straight answer. 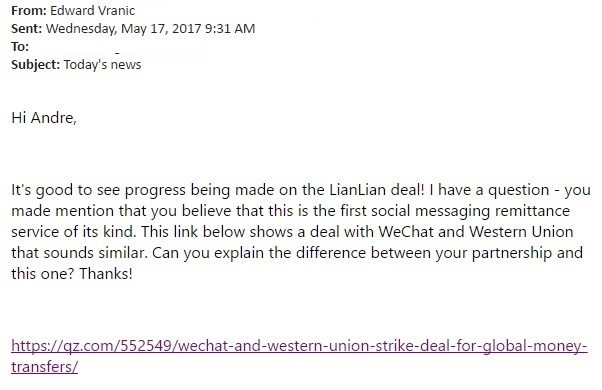 If one is wondering, "well, it may not be as integrated, but Western Union still has a deal with WeChat. FGD and LianLian won't be the only player in town". Remember that a fully integrated tech solution is far more sticky than a marketing deal. In my opinion, a deal like this for FGD makes it a buyout target for Western Union. 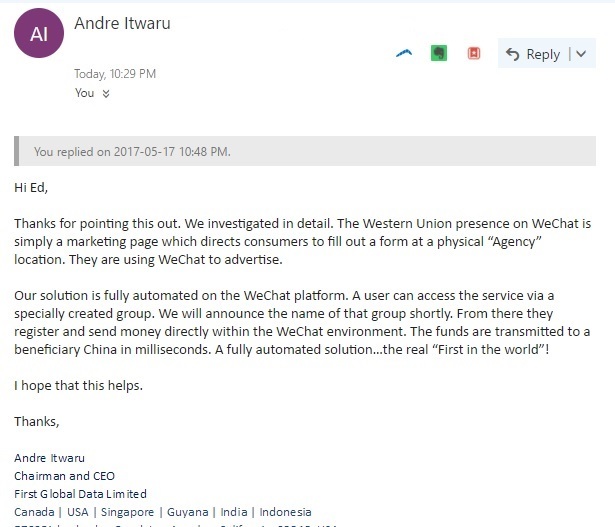 If Western Union has the marketing deal and FGD has seamless integration into the platform, it just makes too much sense for Western Union to go after FGD in order to solidify its position on WeChat. Or at a minimum look for a friendly collaboration. The platform must be proven first and it is just in the beta testing phase so it's not there yet. Don't go rushing out to buy the stock just because I said it was a buyout target. Use your head and come to your own conclusions. When I created the investor groups on Facebook, I thought it would be a great tool for users to discuss stocks honestly using their real identities, instead of the untrustworthy atmosphere of other message boards where people can hide behind profile handles or multiple profiles. I didn't set them up to be a personal babysitter for people's investments. I was in a good mood today because while FGD tanked, I have had a great streak of luck on day trades and options trades recently, which has enabled me to free up some cash and take advantage of a buying opportunity today. But that good mood was soured a bit when I had to answer a bunch of messages on Facebook. Now that I'm back at my computer I see a whole bunch more. So I'm setting up this FAQ to minimize the amount of personal messages I get. A good day for me will be when I finally get zero personal messages that day. Q1: Are you still holding PKK, FGD, SCG and PEEK? What about other stocks you've mentioned? A1: I will start this off by saying I feel insulted when I get questions like this, like I'm some kind of penny flipper after I wrote extensively about these stocks. I have VERY large positions in these four stocks, in that order by dollar value. It would take me multiple days to sell my positions if I wanted to, and I have no reason to at this moment. Like any normal person I do buy and sell to manage cash flow and maybe take advantage of a short term trade, but I'm still going to hold large stakes in these stocks. For instance, I recently had to make some tough choices in order to participate in the SCG private placement. Luckily the winning streak I've had allowed me to buy back some of what I sold already and I'm optimistic that I can get most of it back. But I certainly would not sell everything. If one day I sell one of these stocks for good I WILL MAKE A STATEMENT THAT I SOLD. This also greatly irritates me because it comes with the assumption by the sender that I'm on Facebook 24/7 just waiting to answer their messages. I often take more than 24 hours to respond. I do this partially to slow the message flow down because as soon as I send a message I get a response back 10 minutes later and I'm back at square one. Other times I'm just not on Facebook or near a computer in general. Especially during the summer. New policy: You get ONE chance, of which I will direct you to this FAQ. And if you continue to ask me through private message if I sold out of any of these four stocks, I will block you and remove you from the Facebook groups. This type of question is very annoying and insulting to me, and I don't want to see any more of it. I'll add this in because I have officially written about these stocks: I still hold a small amount of SJL (sold most of it) and that I sold my DGO and HRE positions (still hold my HRE warrants), partially to fund the aforementioned SCG private placement. All other stocks that I may have talked about buying on the boards but didn't make an official article or target or anything like ITT, RHT, ONC etc. I have sold. I've also stopped posting on that Canadian Traders group because I got too many PM's asking me about this and that trade. I might buy these stocks back in the near future. Nothing against them, I just saw better opportunities. Namely the SCG private placement and if people have seen the performance of SCG since then, they can understand that I made the right move. Q2: So how are PKK, FGD, SCG or PEEK going? Do you have any special insight? A2: Any insight I have I WILL POST ON THE GROUPS OR IN AN ARTICLE. If you have a question about a stock, POST IT ON THE RELEVANT GROUP. So I'm not the only one burdened with answering it. Q3: Hey, how's it going? A3: Lousy, because I'm answering Facebook messages like a secretary instead of doing something I enjoy. If you have something important to say get to the point. No more small talk please. No offense don't take it personally. I just get a lot of this and it gets tedious real quick. Q4: Do you want to hang out some time? A4: I've never been asked out on so many man-dates in my life lol. It would be cool if more women were into the stock market. I plan to have a get-together one day in a larger group, but when these stocks are higher. These stock prices aren't acceptable for celebration for me just yet. As far as one-on-one meetups, I can be open to it, just be cognizant of where I live. I'm in the northeast end of the GTA. If you ask me to meet at something like 600 King St West I am going to be very irritated with that location. I didn't leave the workforce because I enjoyed the time it takes me to get downtown. Unlike questions 1 and 2 I won't be pissed off with things like this. Or business opportunities or random, interesting conversation that leads to something important not like Q3. Q5: What do you think of x stock? Or have a look at x stock. A5: A 99% chance I don't know it, or I know the name and a very basic knowledge of it and don't have any good insight to share. Particularly if its a commodity stock. You people JUST saw me try and fail miserably with DGO. I don't know the junior/explorer mining or oil industry. Why are you asking me about these stocks? There's this stock with a good balance sheet, strong earnings, good growth and I think is undervalued. A: Thank you, I'm always looking for more of these types of stocks. I will take a serious look at it. That's all I can think of for now. I might add more later.